Some engineers work for years before one of their designs makes it out into the world. 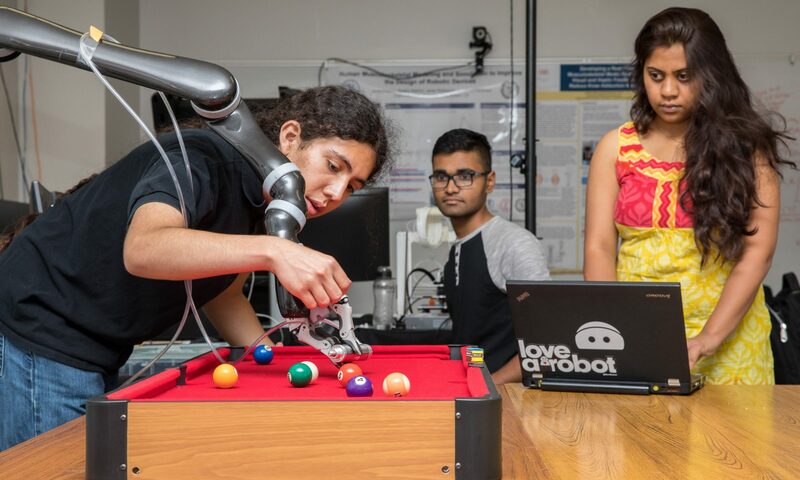 But thanks to a collaborative program between the CSULB College of Engineering and Southern California Gas Co., some students have that opportunity as an undergraduate. Each year, SoCalGas assigns technical problems to teams of mechanical engineering and chemical engineering students who work to resolve them as part of their Senior Design Projects. The problems are challenging and thought-provoking. Rather than draw on results from other researchers, the students must come up with solutions of their own. “Google is not going to help,” said chemical engineering major Isaac Okoka, who worked with fellow chemical engineering major Jasper Kelly and mechanical engineering majors Tim Deuus and Michael Magdangal on a plan to create a hydrogen pipe that would fit inside existing natural gas pipelines. Such a development would save the cost of digging new pipelines. One challenge was that hydrogen has to be pressured at 1,000 PSI for the pipeline’s entire length. In addition, the hydrogen piping had to be flexible enough to fit inside an existing pipeline. Chris Asfour, Adam Still, and Carla Duenas, all mechanical engineering majors, worked with chemical engineering major Hanif Payandeh to develop a low-nitrogen-oxide-emitting cooktop that uses a less polluting combination of hydrogen and natural gas. Although a popular source of clean energy, natural gas on its own does produce NOx, which is a precursor of smog. Among the challenges: It’s difficult to mix the gases, considering that hydrogen comes from a tank at 4,000 PSI and natural gas comes from the wall at extremely low pressure. The blending process took a lot of time, as did testing and data collection. Team members said they learned how to apply theory they’ve learned during their undergraduate studies and how to work in teams, as well as scheduling and prioritization. Dylan Montgomery, Salman Najmae, and Thomas Newton, joined by chemical engineering majors Jennifer Vinh and Nicole McInerney, were tasked with creating a prototype using biomass to provide methane to heat buildings. The team’s plan would make use of a surplus of discarded and unconsumed food. In the U.S., according to the Department of Agriculture, nearly one-third of food is discarded or otherwise wasted. The organic matter would be mixed with bacteria to produce biogas, using anaerobic digestion, a reliable and self-sustaining process. The biogas would then be filtered to produce the methane. Payandeh and Vinh also had a chance to present their research at the Society of Petroleum Engineers’ 2018 Western North American Regional Student Paper Contest on April 23. Payendeh placed second. The five-year-old CSULB program is led by Rodger R. Schwecke, SoCalGas senior vice president of Gas Transmission and Storage and a 1983 chemical engineering graduate. SoCalGas provides funding for each project, plus a $1,000 scholarship for each student. Students selected are divided into teams and begin with a concept, conduct a literature survey, consider how to approach the project and also carry out design, development and fabrication. Teams present their results for SoCalGas engineers and executives at the end of the spring semester. The program’s team leader is CSULB mechanical and aerospace engineering professor Parviz Yavari. CategoriesIndustry Partnerships, Research, Student Resources, Students, Sustainability Tagsgas coimpany program, Parviz Yavari, senior design projects, Southern California Gas Co.